—First Greeting of His Holiness Benedict XVI, Central loggia of St. Peter's Basilica Tuesday, 19 April 2005. 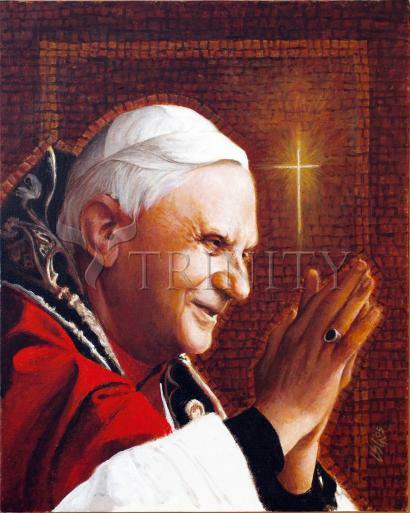 Cardinal Joseph Ratzinger, Pope Benedict XVI, was born at Marktl am Inn, Diocese of Passau (Germany) on 16 April 1927 (Holy Saturday) and was baptized on the same day. His father, a policeman, belonged to an old family of farmers from Lower Bavaria of modest economic resources. His mother was the daughter of artisans from Rimsting on the shore of Lake Chiem, and before marrying she worked as a cook in a number of hotels. A year later he began teaching at the Higher School of Freising. In 1953 he obtained his doctorate in theology with a thesis entitled "People and House of God in St Augustine’s Doctrine of the Church".